When it comes to moving, often times the parents end up doing the majority of the decision making. While this is incredibly important when it comes to budgeting, it is an necessary stress reliever to have the entire family involved in at least some aspects of the moving process. Whether you are moving for a change of scenery or a mandatory work change, the process of moving is stressful for everyone involved—even the kids. Getting your entire family involved in as much of the moving process as possible can be a bonding experience. Not only do you have the opportunity to make positive memories, but you can make the process much more efficient as well. The trick is getting your kids interested in the entire process. The truth of the matter is, children take a cue from their parents. If the parents are excited about the process, the kids will be too. The following tips will give you an idea of how to involve your kids in the moving process. Whether your kids are teenagers or toddlers, it is important that they get a say in the house you choose. Ultimately, you need to pick the one that fits your budget and location needs, but knowing that your kids are happy with where you’re going to be is a huge stress reliever. Also, when your kids are excited about the prospect of a new room, their willingness to help make this happen soars. So give your child a choice. If you are stuck between two or three good houses, bring your child to the place and ask them to make note of certain factors. Ask them what they like about each location and what they think is best. Make it clear in this process that it is ultimately your decision where you move, but that your child’s opinion matters to you. Also, give them a choice in how they will decorate their new room. Are you thinking of repainting? Let them pick the color. New furniture for a growing child? Let them pick the theme. Give them a say in their new place. For little ones, packing up their toys can be traumatizing. However, if you make the packing process into a game, they will be more likely to cooperate. Do a minute to win it competition. How quickly can all their blankets be folded and put into boxes? How many of their stuffed animals can get in the “car” (the box) to the new home? Also, have the child set aside a few favorite toys to ride in the family car with them as a comfort. This will help the child remember that their toys are in the moving van right behind them and offer peace of mind. Older kids may not be interested in games, but they will certainly be interested in bribes. These kinds of behaviors are not always the best president to set, but every now and again adults need motivators too. We adults motivate ourselves to complete goals by giving ourselves spa days and the like. The same can be done for our pre-teens. If you don’t want to set the president of giving them money, find another event or item they’ve been wanting for a while and give them a packing goal. If they complete it within a certain amount of time, you will take them to the movies or buy them Starbucks. Choose something small, but meaningful. It will also pose as a great break for both you and the child from the stress of packing for a while. Using smaller boxes in the packing process actually allows you to organize better. While you have more boxes to move in and out of the truth, you’ll have an easier time compartmentalizing your items. This will make unpacking a much simpler process because you won’t have 20 plates in with Christmas ornaments and a toilet brush. Your packing process will be streamlined and much less random. Plus, your children will be less tempted to stuff strange items in boxes where they do not belong because there simply will not be space. For greater organization, use apps. Not only will using an app with a cloud allow you to take pictures of boxes to keep track of items, but you’ll be able to share it with your family so everyone can be on the same page as to where items are. This will make the unpacking process so much easier. Speaking of easy, don’t make more work for yourself. If you are moving bulky items like dresser drawers or filing cabinets, do not unpack them first. Simply have your moving service—like Removals Platinum furniture—wrap the entire furniture item up and have the movers secure it in the truck. 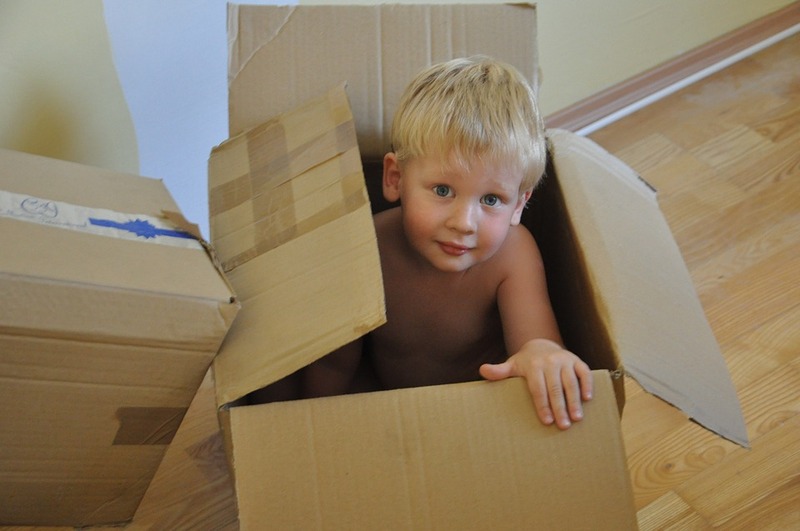 Your kids will love not having to unpack all of their clothes from the dresser just to repack them again in boxes. This is especially popular with younger kids. Once the house is completely unpacked—and the kids have totally demolished the bubble wrap—have your family move all your unwanted boxes into the backyard. Then, there are a couple ways you can do this. You can have your family have a massive box massacre where you all jump on and stomp as many boxes as you can. Or you can do this more methodically and create a contest. You can have each child holding a box, put on a timer, and put on music. Whoever destroys the most boxes by the end of the timer wins a prize. This can go on until all the boxes are destroyed. Then, order your family a pizza and kick back with a movie in your newly unpacked living room to celebrate your successful family move.